I’m getting ready to be gone for two weeks. I’m super excited to be on a lecture tour for the book and to visit my family, but on the other hand,I'm reluctant to leave our new state as we’ve just settled in to our new place. Although, as I type this, I don’t even really buy it because I LOVE traveling to new places, meeting new people, and opening their minds and bodies to mind-blowing information. To get ready this tour, I decided to paint my toes. 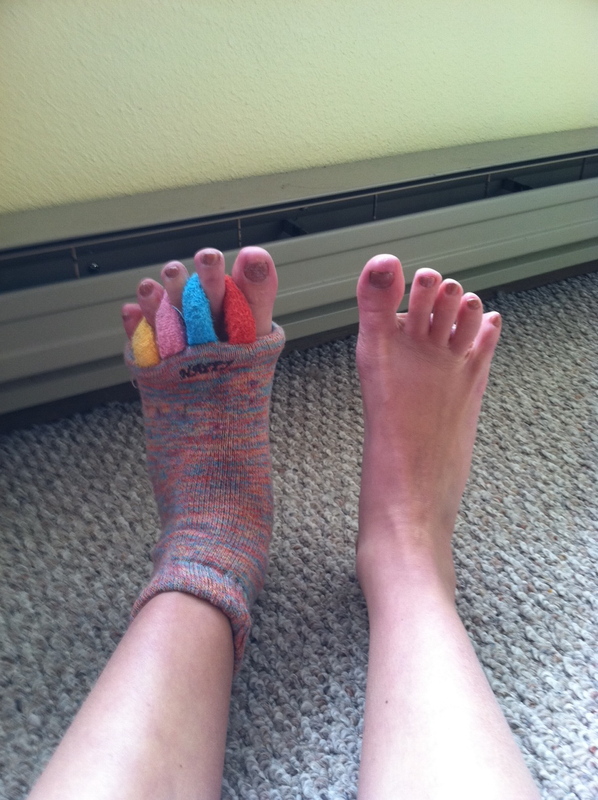 Actually, I decided to paint my toes after finding my Toe Alignment Socks in the back of my drawer. I stopped wearing them all the time once I started wearing my Vibrams all of the time. A mistake, I realized, once I put the socks on. Or, sock, actually, because I can only find one. Them toes were still tighter than they should be. And it’s a good thing my left foot is tighter than my right, since that's the one I could find. by stretching the adductors (muscles that pull the toes together). Stretching the adductors allows the toe abductors (muscles that move the toes apart) to work once again. You can also do this with your hands, but I often have other things to do with my fingers besides putting them between my toes for 5 hours a day, like type on the computer. And practice speaking Italian. If you're working on toe spreading (a toe-abductor strengthening exercise) you have to undo years of between the toe tension. A little toe exercise here and there is a drop in the bucket compared to how many thousands of hours you have smashed your toes together. That's why I love these socks. They allow me to work on toe stretching for hours. I’m all about time management these days. Now if only someone would invent some sort of sock that went around the neck, pushing the shoulders down from the ears. An alignment turtleneck. Could you please start working on My-Happy Neck Alignment Turtlenecks please? I'd like a multicolored one. And I'd like it to be made from organic cotton or from the hair of humanely raised (and shorn), free-range unicorns, that are only fed rainbows and non-GMO plants. That is something I'd buy for sure. And, if you are wondering what the name of this polish color, it is OPI’s Barefoot in Barcelona, which sounds a lot better than Popsicle Toes or Thirty Degree Weather Make Your Feet Bluish White. Am I Right? I’d also like to take this post as an opportunity to thank those of you who, a year ago, supported the book effort with your foot-ailment testimonial (click). I told you that, if I used your story, I would send you an autographed copy of the book! Here are the stories that I used! If you recognize your comment and your name below, please send me an email with your mailing address and I’ll get your book out in the mail! And if you didn't win, you can still get a free chapter of the book, right now, at www.footpainbook.com. I hope you love it as much as I do! I got my 1st pair of high heels at age 13 and I thought I was just too cute, until an older guy laughed at me for being so wobbly. Devastated but determined, I practiced wearing them and finally succeeded, I even was able to run in them. I couldn’t figure out why I kept getting back aches and finally herniated L5-S1 disc (duh). Went to chiropractic college to learn about the spine and learned about those wicked, but seductive, high heels. - Gayle D.C. I have been walking on 4 toes ever since I was little as my next to pinky toe on each foot never grew out past a certain age in my childhood, and that toe has made it hard to find shoes that fit. They either had to have the top front of the shoe go low below that toe because it sticks up (the pinky toe has curled underneath that toe to support it) or go high enough that it doesn’t rub that toe and make it sore because it is too tight. Can you imagine cramming that toe into heels and walking without it hurting? Wasn’t a good idea but I have done it anyway since highschooll. Your exercises and Earth shoes has helped me so much be able to spread my toes now and the shoes don’t rub the top of my toe next to my pinky toe and make it sore. No more sore and aching feet! I am forever grateful! - Lanene W.
My first pair of high heels were the plastic ones they used to, and maybe still do, sell in the “girl” kits you’d find in the drug store toy section. They often came with gaudy, clip on earrings, lip gloss and the such. I was about 7 years old and wore them to bed the first couple of nights. That phase died out in me pretty quickly, thankfully, since I was one of the taller girls in school not to mention a creature of comfort. Those darn things hurt! These days I prefer to be barefoot….which makes me truely feel like a little girl again. - Amber N.
I am here to say that not only high heels but even toe scrunching flats are painful for me. My mother put us in sensible brown oxfords all through grade school and we hated her for it. When we reached the ripe old age of 11, we were allowed to pick out and wear whatever shoe types we wanted. I was in love with a pair of light blue flatties which I bought in a size 7 l/2 – only my foot measured a size 8 l/2!!!!! I paid a dear price for trying to have my feet appear smaller!. Bunnions, hammer toes, fallen arches and very bad arthritic knees! Thank you, Katy, for introducing me to Rexi and Earth shoes so that at 64 years of age, I’m finally able to spread my toes, lessen my bunnions and hammer toes and walk for at least an hour with no knee pain!!!! - Chris D.